OK, so chronologically inaccurate, but this was a weekend that (a) probably saw more Jackpoters racing than any other weekend and (b) a lot of them were going long. 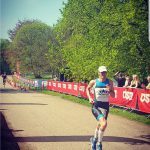 Let’s start with the top achievements: Colin Hill and Eddie Howarth both raced in the 70.3 Ironman World Championships at Zell am See in Austria. For some reason the organisers set the athletes off at 11:30, making sure they’d be running in temperatures well into the 30’s. Eddie was soon out of the water in just 25:43, closely followed by Colin in 27:31. fantastic swim times from both. That form followed the pair onto the bike, with Colin edging the honors this time in an amazing 2:27:19, with Eddie sniffing Colin’s wheels in 2:28:54. Looking at equally awesome run times of 1:37 and 1:41 for Colin and Eddie respectively, it is difficult to imagine how much suffering will have been endured. In Eddie’s words, ” all I did on the first half of the run was drink water and cool down. Very disappointing run time, every mile just hurt”. The rest of us will take your ‘disappointing’ run anyway! Eddie finished in 53rd position in AG and 383 overall. 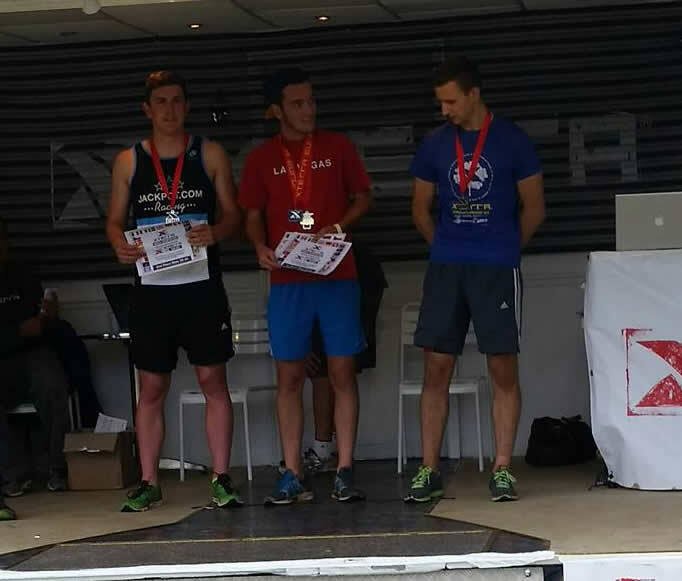 Colin, meanwhile, fulfilled a lifelong ambition by finishing in the Top 10; 10th place in AG and 272nd overall. Back in the rather cooler climes of Yorkshire, Jackpot kit was very-much in view at The Rubicon middle distance race taking place at Newby Hall. testing the othe end of the clock, most athletes surfaced around 4:30 or 5:00 in order to be registered and racked for the briefing at 6:15. Naturally that meant a chilly start for the river swim, and air temperature stayed on the cool side for the start of the bike. By the time the run section came around, however, the mercury had risen just enough to make it uncomfortable. The results were rather confused with individuals turning to relays, others taking individual spots and a couple of drop-outs, plus the race (dis)organisers aren’t eactly reliable! But attempting to unravel the situation… First home for JP was Ben Garrard, just 30 seconds ahead of Alistair Cooke in a top time of just 4:29, with Francis Riley following in third at 5:01. Frank will be very surprised since he only swam for Team Morley (see below). Matt Wilson will also be surprised to finish as fourth Jackpoter in 5:21 after (yet more) bike problems at the start and given his ‘love’ for running. That surprise will come from knowing that both Matt Pears and Tom van Rossum were well ahead of him. 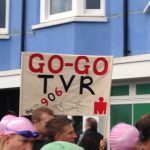 But both Matt and Tom decided to pull out on the run whilst in good positions in the race; Matt to avoid injury and Tom to keep his powder dry for the forthcoming Ironman Wales. There were two relay teams in the race. Tom Bishop put Team 1 into first position with the fastest swim of the day in just 25:36, before handing on to Chris Brown on the bike and Matt Hallam for the run. The team came in at 4:07:53, losing out to a team of ringers by just 1:30. What a shame, particularly when the Relay Prize was a water bottle and two out-of-date energy gels! Team 2, better known as “Morley and Grandad Morley” were led off by the real Francis Riley, who handed over to Dave Morley and on to their own ringer from Wakey tri, Chris Gorse, finishing in 4:45:26. “All was going well. 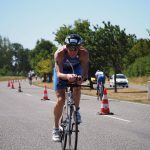 Swim to a bit over plan, bike to plan allowing for a fair headwind and temperatures up at 36C in the shade. I read reports about the heat at this race but thought I’d prepared well with training specifically. 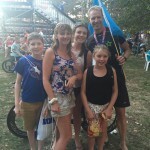 “First 10k of the run was going ok, good rhythm and right on pace. “Then the heat caught up with me. Cramp began to set in and I suspect some sun stroke. Focus on keeping cool and keep moving. Descended into short run intervals before cramp kicked in again. “Anyway, it became operation finish as my goal slipped away. A bit disappointed to have missed my goal and not bettered my previous result but hey ho. All this talk of heat is making me sweet, so let’s cool down again and get a bit muddy. 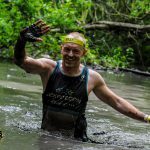 Tom Linton-Neal was racing the Xterra European Champs near Cranleigh. 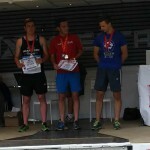 In “More slippy than slippy” conditions, he took the National 20- 24 AG title and second in the European championships !! Maui next stop! Next stop…Rutland…and to the Vitruvian where Andrew Whiteley was in fine form again to guide the brilliant Haseeb Ahmad around the middle distance race. 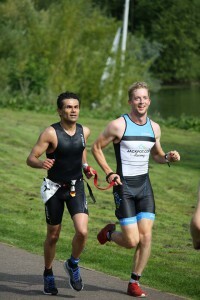 It was Haseeb’s first middle distance…and what a tremendous race Haseeb and Andrew had. Paced well on the swim and the bike to an awesome half marathon in a time of 1:33, finishing in 4:43 overall. This put Haseeb 8th in his age group and 66th overall. This put Haseeb 8th in his age group and 66th overall. An excellent day and superb photo to match! 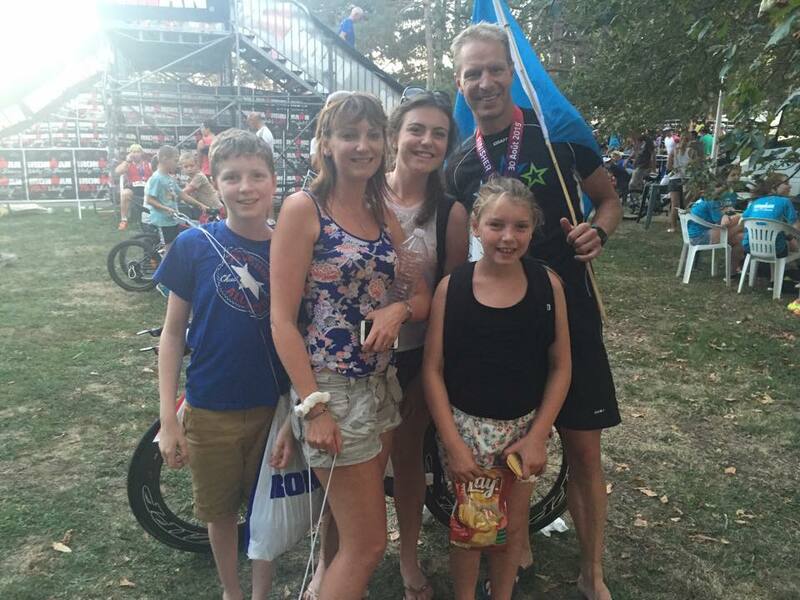 Let’s hop across the pond again…almost feels like we are completing our own triathlon doesn’t it… to the Castle Series at Chantilly where Cat Jameson takes yet another win at the Olympic distance race! FANTASTIC! Cat was over two minutes ahead of the next lady and was 7th athlete overall over the finish line. Just an outstanding season you are having Cat!